There are life-changing technologies that are being developed at the intersection of health evaluation and diagnosis. For example, Neurotrack has developed a cognitive test to predict and diagnose the onset of Alzheimer’s Disease. And a new startup, Cognoa, is launching to help evaluate children’s risk for Autism. As CEO Brent Vaughan explained to me, the incidence of autism has risen to 1 in 68 children in the United States, and the incidence of all learning delays in children is now close to 1 in 5. Families are faced with enormous individual challenges to navigate through the complex healthcare ecosystem to understand their child’s risk and how to take action. And the average lag time between an initial warning sign and a diagnosis of autism or other developmental condition is around 13 months, with the average waiting time to see a specialist who can provide a clinical diagnosis around 1 year. By the time children get through the system to the clinical professionals, they’ve lost the time to benefit from intervention programs, which are known to be more effective in younger children. Once the child receives an official diagnosis, families are often left to determine alone how to manage their child’s care and therapy. 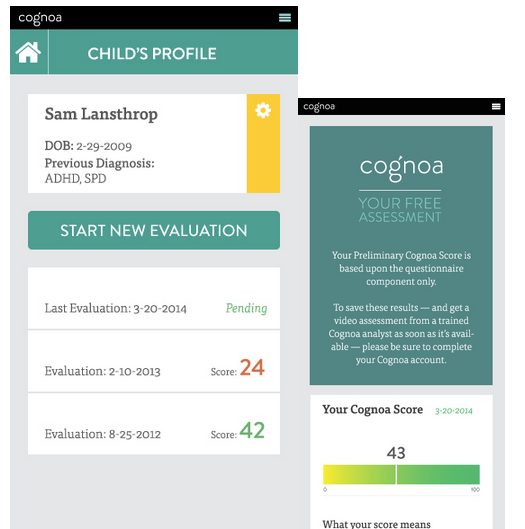 Cognoa’s test on the iPhone evaluates the risk for developmental delay and autism for children before the age of 3. The app asks parents set of questions around your child’s behavioral tendencies (i.e. will your child play with peers when in a group with two or more other children), and the app also allows parents to take a home video under 5 minutes showing a child in a simple set of activities. With this data, Cognoa’s test analyzes the video and answers to the questions and will provide an assessment on whether the child has a risk for autism. The technology on the back-end was developed by Dr. Dennis Wall, Associate Professor of Pediatrics and Psychiatry at the Stanford University School of Medicine, where his lab is developing statistical approaches to decode the complexity of autism spectrum disorder and related conditions. It’s important to differentiate that Cognoa isn’t actually diagnosing, but instead just evaluating whether there could be a developmental risk. It’s still early days to determine the efficacy of the test but Cognoa has been tested in several studies and over 20,000 times, and is showing accuracy of evolution at and above 90% in children under 4 years old and as young as 13 months.